India, 4th February, 2017: Canon India Pvt. Ltd, India’s leading Digital Imaging Company, announced the launch of an extensive range of offerings in its Professional Printing Domain. With this launch at Print Pack India, Canon India unveiled the highest number of product in the last eight years in a single show. In wide-format, the latest offerings include an array of large Format printers, featuring inkjet and LED technology, designed to provide spectacular image quality & diversified applications for, graphic arts industry, signage, fine art and photographic industry. The cutting-edge imagePROGRAF PRO SERIES includes the 12-Color imagePROGRAF PRO-520 and imagePROGRAF PRO-540, 8-color imagePROGRAF PRO-540S and imagePROGRAF PRO-560S. Also launched is the 5-Color imagePROGRAF 671E, offering a right mix of affordability & technology to the SME segment. Another large format printer announced at the launch included an all-rounder printer Océ ColorWave 700, designed for wide range of graphic arts applications like Wall papers, In shop brandings, Signage etc. Consisting of the imagePRESS C850, imagePRESS C750, imagePRESS C650 digital color production presses, the new series incorporates a variety of updated features and technology to help meet the requirements of its target markets, including commercial printers, in-plant operations, and other print service providers. Another Launch is imagePRESS C8000VP based on the successful legacy product C10000VP which has received phenomenal response in Mid & High End print volume segment. Designed to provide offset-like image quality through Canon’s unique technologies, the imagePRESS series brings a revolutionary offering in the cut sheet digital production printing space. Now with improved speed, increased volume capability, and enhanced finishing options, it is designed to offer rich, predictable image quality and a high level of productivity to print professionals. With the imagePROGRAF PRO & Colorwave Series, Canon is offering a state of the art technology that exceeds expectations for image quality, reliability and color consistency. The imagePRESS C850/750/650/850 models boast of vibrant and consistent image quality, outstanding stability, media versatility and maximised uptime. With the 32-beam Red VCSEL laser, it achieves 2400 x 2400 dpi and outputs crisp, clear color images with remarkable clarity and definition at high speeds. The Advance Image Transfer Belt helps achieve quality output on various types of media including media with rough surface such as textured media or envelopes. It is equipped with a large media capacity, maximum of up to 7,650-sheet input capacity with the Multi Drawer Paper Deck. Combining proven imagePRESS features and new print technologies, the Canon imagePRESS C8000VP Color Digital Press has been engineered to deliver production printing excellence for the business advantage of its users. It can help commercial printers, in-plants, production hubs, direct mail and transaction print service providers to produce a broader range of applications in shorter turnaround times. It delivers offset-like, vibrant & stable output quality with high resolution of 2400 x 2400 dpi at print speeds of up to 80 letter-size images per minute in color and black and white on all supported media weights for average monthly print volume of up to 360,000 LTR images per month. The PRO-Series is designed to work seamlessly when changing media types. A first for the Canon large format printers is the addition of a Chroma Optimizer. Used when printing on glossy and semi-glossy paper, this acts as a clear coat, improving color performance and gloss characteristics. Designed specifically to meet the demands of even the most critical photographer, the LUCIA PRO ink formulation includes microencapsulated colorants that enable smooth gradients, an expanded color gamut, and deeper color expression. Boosting productivity and streamlining printing workflows, with Direct Print & Share, the imagePROGRAF iPF671 enables print of a host of file types without an application. With the Océ ColorWave 700, users can enjoy great usability with an intuitive touch screen with tablet-like gestures. Using the Océ ClearConnect touch screen, users can easily preview, print, retrieve, see toner levels and connect to 3rd party software applications. Remaining at the helm of innovation, Canon today has pioneered as one of the best known digital printing firms. 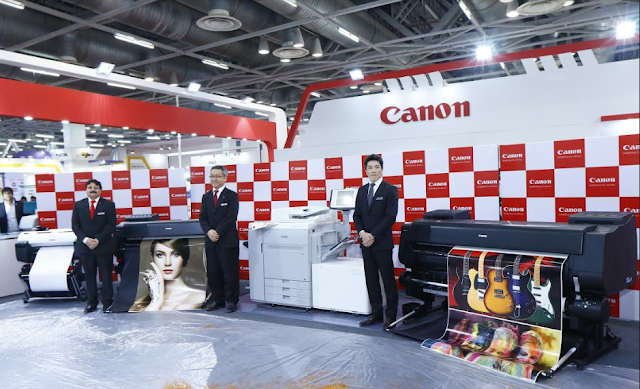 With the focus of the industry turning towards new business avenues where technologically advanced printers are mandatory to siphon growth, Canon products with advanced technology are emerging as the front-runners. Canon India Pvt. Ltd., a 100% subsidiary of Canon Singapore Pvt. Ltd., is a world leader in imaging technologies. Set up in 1997, Canon markets over 200 comprehensive range of sophisticated contemporary digital imaging in India. The company today has offices and warehouses in 14 cities across India and employs over 1000 people. Canon has over 500 primary channel partners, 14 National Retail Chain partners, and over 6000 secondary retail points. Presently Canon has opened 215 retail stores called the Canon Image Square, in 103 cities in the country. Canon’s service reach extends to over 5000 towns with 18 Canon camera service centres and 37 printer Canon Care Centres. Canon India also has 141 authorized service centres for printers and 195 camera collection points. In sync with its corporate tagline ‘Delighting You Always’ , reinforced by World class technology, Canon offers an extended product portfolio, including copier MFDs, fax-machines, printers, scanners, All-in-ones, digital cameras, DSLR, Cinematic imaging products, camcorders, cable ID printers and card printers catering to the multiple market segments of consumer, SME, B2B, Government & Commercial. Canon India recorded revenue of INR 2348. 6 crores in the year 2016.